If you are plagued with multiple dental issues or your oral health has been compromised in any way, you may be a candidate for a type of dental surgery known as full mouth reconstruction, or reconstructive oral surgery. Those who need a full mouth reconstruction usually have several severe dental complications. A simple cavity or having a few crooked teeth can be fixed with much smaller measures. Reconstructions are necessary when the majority of your teeth have problems —cavities, chipping, decay, severe crookedness, severe gum disease, a severe accident or trauma to the face and mouth, etc. The absence of many teeth also might be what causes you to need reconstructive oral surgery. Missing teeth are not only unsightly but they can cause you to lose important bone structure in your mouth and lots of shifting around of your remaining teeth. This is why it’s so important to choose a dental team with the skills and training necessary to create the right treatment options for you. 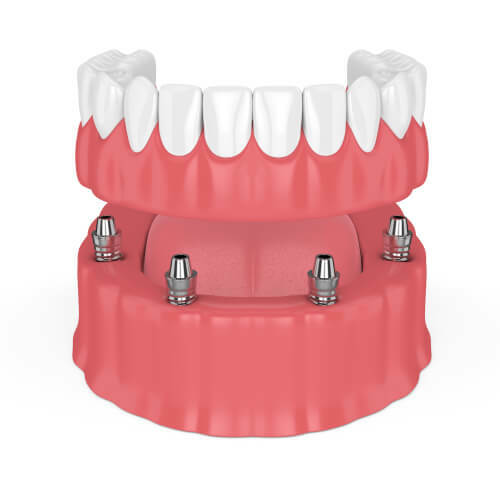 Implant-secured dentures are a big step up from traditional dentures. While reconstruction may require more time and money upfront, many patients opt for it over dentures because of the long-lasting freedom and benefits of having your own teeth. Denture wearers deal with problems including discomfort, gum irritation, halitosis, slippage, and chewing issues. Dentures can also be hard to keep clean, and can affect the individual’s confidence when eating and speaking. Patients can trust our expertise for a custom, comprehensive smile redesign process. We value our wonderful patients and do everything we can to make them feel happy and comfortable. Dr. Henry will help you determine if this type of dental surgery is the right one for you. Our office prides itself on blending cosmetic and restorative techniques for a stunning smile. Dr. Henry is using the most recent advances in dental implant technology. Our office is utilizing 3D treatment planning and navigation for placement of dental implants. With X-Guide navigated surgery, we utilize live 3D views of each patient’s anatomy. It is like GPS for our drill during the procedure. The X-Guide provides interactive, turn-by-turn guidance during the implant procedure for more exact implant placement. This allows for precisional placement of the implant which allows for better function and aesthetic outcome. We will begin with a consultation. Each full mouth rehabilitation is unique, and Dr. Henry will need to evaluate the health of your teeth and gums. He will also help you design a dental treatment plan based on the specific care and comforts you require. With a few simple appointments, you can have a healthier and happier smile that will last a lifetime. Learn about your full-mouth reconstruction options and schedule your consultation today.